These scenes of desolation. 11 February 1973, give little indication of how busy this area was from the 1880s onwards. Around three sides of Seafield Mews, as it was then called, were stables used in prosperous job-master’s business. Mr S. Young, who ran this business for many years, lived in Seafield Cottages, even in its final dilapidation. With the passing of the horse, in the early 1920s, a motor garage and, later showrooms were built on the Kingsway frontage, and for the next 50 years the area was given over to motor transport. 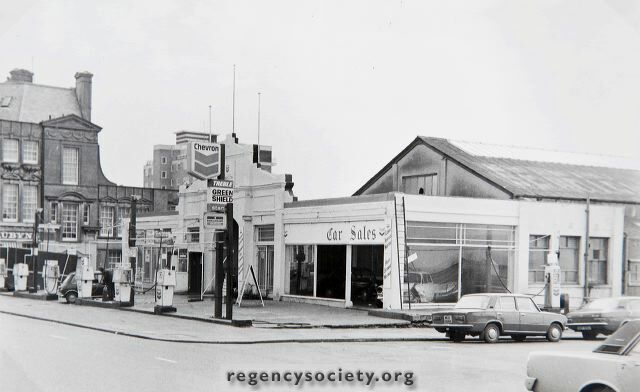 Now, in 1976 , the garage has gone and the site is in disarray. Who knows what form redevelopment will take.